Harold in Italy (the original title is Harold en Italie) by Hector Berlioz is another favourite work of mine, I discovered it in this way. I first heard only one movement of it, from a music encyclopedia with recordings that we had at home, and was immediately impressed by it. Fantastique. 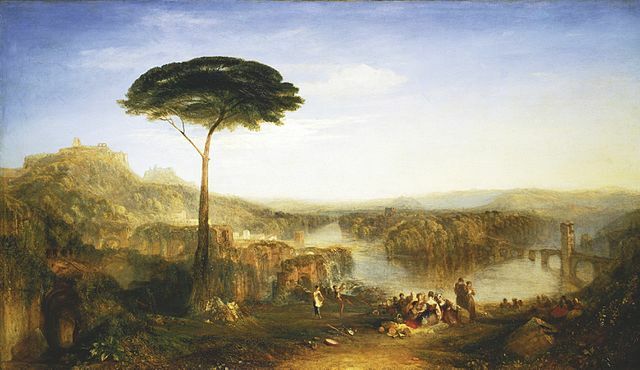 Then, after winning the Prix de Rome, a composition award given by the Paris Conservatoire, he spent fifteen months in Italy, between 1831 and 1832. And this stay had a long lasting influence on Berlioz, especially evident in Harold in Italy. More than the environment at the Academy of France in Rome and more than attending concerts and operas, Berlioz enjoyed wandering in the wild Abruzzi mountains, meeting people in the villages there, listening to their songs while playing with them on his chitarra francese. The only type of music that struck him in Rome was that of the pifferari, a group of folk musicians playing bagpipes and a sort of oboe, who around Christmas come down from the mountains to play before the statues of the Madonna, wearing large woollen coats and pointed hats. (By the way, you can still meet these pifferari around Christmas in cities like Milan, playing the same instruments and tunes, wearing the same clothes). 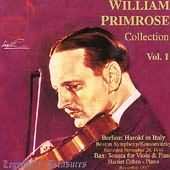 His memoirs are so lively in the description of his adventurous wandering and all the encounters… sometimes they made me really laugh a lot... very useful to me to better understand Harold in Italy and his music in general. 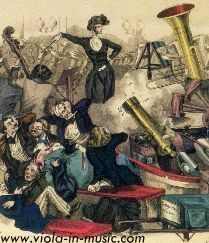 In 1833 Paganini heard the Symphonie Fantastique at a concert in Paris and congratulated Berlioz about it. After this concert Paganini told Berlioz about a big Stradivari viola he had and asked Berlioz to write a concerto for him, he said he was too ill to compose. "there is not enough for me to do, I should be playing all the time". Paganini didn’t like it and never played it. Anyway Berlioz went on writing without worrying about having to write for a virtuoso and ended up with writing a symphony based on his memories of Italy. Eventually Harold en Italie was performed at the Paris Conservatoire in 1834 by Chrétien Urhan, the principal viola of Paris Opéra, and several times in the following years, always with great success. A few years later, Paganini was in Paris again and attended a concert including the Symphonie Fantastique and Harold en Italie conducted by Berlioz. 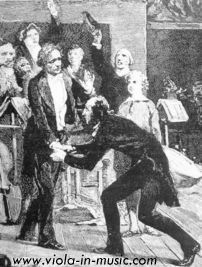 After the concert Paganini went to see Berlioz and told him he had never been as touched as by Harold, then kneeled and kissed Berlioz’s hand. Can you imagine what a pleasant shock for Berlioz! considering that for the composition of the Requiem one year earlier he was paid 3,000 francs. Orgie des Brigands, memories of past scenes. 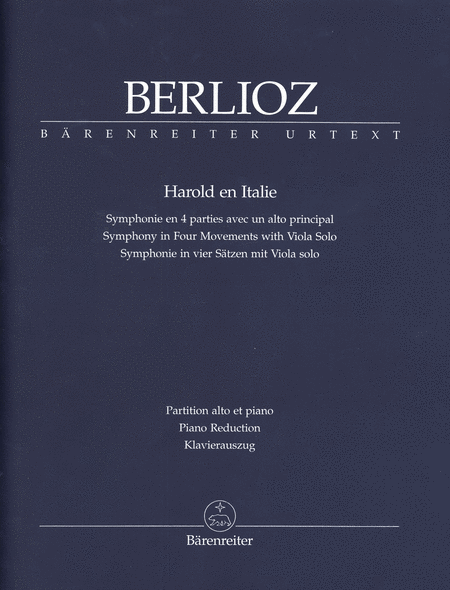 Harold en Italie became quite popular and Berlioz's friend Franz Liszt made a transcription of it for viola and piano which greatly impressed Berlioz, he said he would have never thought the piano capable of such sort of 'orchestral' sonorities. This was due to Liszt's extraordinarily ability as a pianist, first of all, and as a composer. Indeed I like this work a lot, I think the pianist who plays it has to imagine he is the orchestra or conducts it, he should listen to the original orchestral version many times and try to put all those different sonorities into the piano (or rather draw them out of it?). Challenging task, yet rewarding! Being by a great composer like Liszt, it's more interesting than other existing piano reductions, and I think it is also a wonderful opportunity for a viola player to add another concert piece to his/her repertoire without having an orchestra at hand, and the pianist cannot complain about having to 'just accompany'. For the Berlioz-Liszt version, click here or on the picture if you wish to buy it to perform it with piano, or here to buy the full score and orchestra parts of Harold in Italy. Berlioz had begun to study music with his father and played flute, flageolet and guitar, but unlike most other composers he didn’t excel as a performer on any instrument. He was never taught to play piano, he thinks that his father might have thought piano could have been “dangerous”, could have made him become interested and attached to music more than other instruments. Berlioz in his own biography says this was a lucky thing, because he could always compose freely, away from the keyboard (unlike many other composers). His instrument was the orchestra, he tried to draw new sonorities and effects from each instrument and from the whole orchestra and excelled in this. 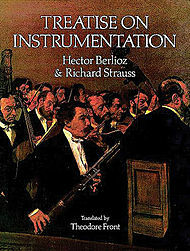 In the next pages you'll read more in detail about the Biography of Hector Berlioz and what Berlioz thought and wrote about the viola in his Treatise on instrumentation and orchestration. 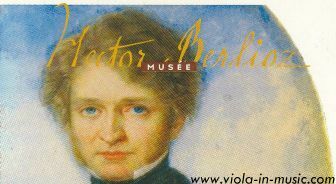 What did Berlioz think about the viola?